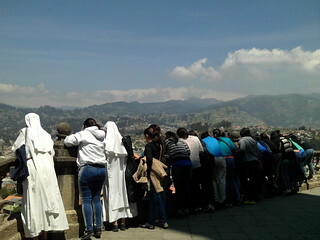 The HMY group of the province of Manabí (Ecuador) together with some of the Servant Sisters of the Home, made the pilgrimage to the shrine of Our Lady the Guardian of the Faith in Cajas which is part of the Azuay province, in the North of Ecuador. 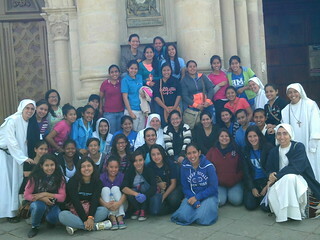 The bus with some girls and two sisters departed from Chone on October 31 at 5:00 in the morning, stopping by Playa Prieta to pick up the youth group that was waiting and then went on to our first destination of the pilgrimage: the Sanctuary of Nobol. In this place the incorrupt body of St. Narcisa de Jesús is preserved. She was an Ecuadorian lay woman who stood out for her tireless work as a Catechist among the poorest. There, we attended mass and then we venerated the body of the saint, visited the museum where they have the few things she had at the time of her death and then to regain our strength we had lunch outside. Then we continued the pilgrimage, as we still had a considerable distance remaining for us to reach our destination. The road became shorter by the songs, jokes and moments of prayer that we alternated on the bus. And thus, little by little, we spent the time until we reached the place where we would be staying. 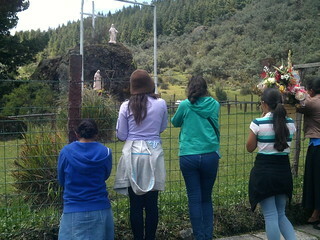 But before that, the sisters gave us a surprise: on our trip we passed near a shrine to Our Lady and even though it was late, the sisters surprised us by stopping there to greet the Virgin Mary for a few moments. It was a very special moment for all. It was a beautiful encounter with our Mother there at night time and after such a long journey. Our Lady was waiting for us with open arms to give us a welcoming hug and to tell us: "My daughter, I was waiting for you!”. Now, after this comforting meeting with Her, we all were looking forward to reaching the place where we would stay the night, eat dinner and get some rest. The next day we spent the whole day in the shrine, although originally it was not planned like that. We arrived in the morning with enough time to have a moment of prayer before Our Lady or in the Blessed Sacrament Chapel before the Eucharist, and then we participated in the Holy Mass. In the afternoon after lunch there was some more time to be with Our Mother. Then we held a meeting which helped us to 'get our act together' making us realize how important it is to give glory to God in and with our lives. 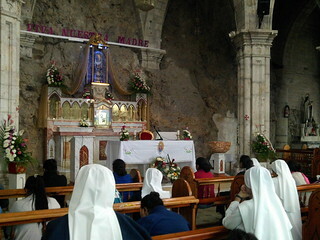 Then we went to the grotto of the Virgin Mary to pray a few decades of the Rosary accompanied by songs, and had the rite of entrance and renewal to the Home by some of the girls. And then we had to bid farewell to Our Mother, at least for the time being. After dinner, we watched a documentary on the life of Alexia, a Spanish girl who died with a reputation of being holy and who is now in the process of beatification for her exemplary life and death. She died after enduring bone cancer, an illness that she suffered in a heroic and admirable way. Again the Lord was placing along this journey an example to imitate and to encourage us to live in holiness our Christian life. The day came to an end and we all felt the need for a little rest in order to be able to continue our journey the next day. On Monday, we made a pilgrimage to two shrines of the Virgin Mary in two different cities. The first one was the shrine of the Franciscan Fathers of Our Lady of the Cloud in Azogues, where we went to Mass. 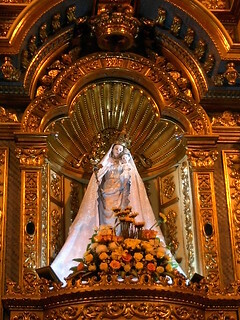 The history for the veneration to this advocation of the Virgin Mary goes back to colonial times. The bishop of this diocese fell ill and was miraculously cured by the Virgin Mary during the processional rosary that was being held begging for his recovery. In Biblián we visited the shrine of Our Lady of the Rocio, built on a rock in the city, which is in the province of Cañar. There we prayed the Rosary and sang our hearts out, with all our love, to Our Blessed Mother. On the last day we went to Mass in the Cathedral of Cuenca and were able to visit some of the churches of the Historic Center of this city. 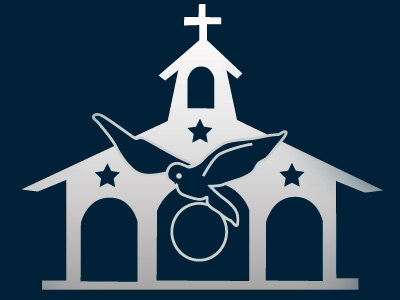 In each and every one of these Marian places Our Mother had something to say to each of us to help us live in her presence, to be more faithful to our commitments of Christian life, to open ourselves more and more to grace, to be more generous and consistent in our decisions, etc. This was assured to us by the pilgrims who gave their testimony on the bus ride when we were returning home. These have been unforgettable days for all, girls and sisters, for those that already had been to these places, and for those who had gone for the first time as well. It is clear that the Lord is generous with pouring His graces over the souls that are ready to receive them with total openness.